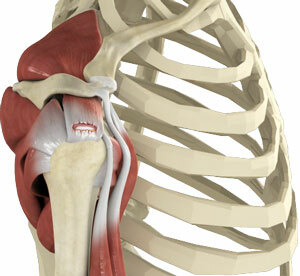 Rotator cuff- A group of 4 tendons make rotator cuff and it holds the head of the humerus in the socket. Biceps tendon- The biceps tendon is a long cord-like structure which attaches the biceps muscle to the shoulder and helps to stabilize the joint. Caraco Clavicular Ligament- This ligament connects the clavicle with the corocoid process of the scapula. 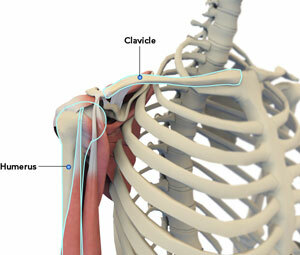 Acromio Clavicular Ligament- It connects the clavicle with the acromion process. Glenoid labrum- The Glenoid labrum is a ring of fibro cartilage surrounding the cavity of the scapula for stabilization of the shoulder joint. Articular cartilage or the capsule- It is a capsule that surrounds the shoulder joint and helps to keep the ball and socket normally aligned. Frozen shoulder, also called adhesive capsulitis is a condition characterized by pain and loss of motion in shoulder joint. It commonly affects the left shoulder than right and occurs more often in women than men. The exact cause of frozen shoulder is not known. It is most commonly associated with diabetes and a few other endocrine diseases. The main symptoms include pain, stiffness, and decreased motion of the shoulder. Frozen shoulder is a self-limiting disease and symptoms usually subside after a year. Treatment is aimed at pain control and restoration of motion. The treatment of frozen shoulder requires a combination of non-steroidal anti-inflammatory medications, steroid injections, and physical therapy. Cortisone injections: Cortisone injections are given directly into, or near to the shoulder joint. It reduces the inflammation within the frozen shoulder joint. Cortisone is a type of corticosteroid released by the adrenal gland in response to stress. Cortisone is a potent anti-inflammatory medicine that can reduce inflammation, but is not pain reliever. Cortisone injections typically result in pain relief within a few days, which is because the inflammation diminishes. The effects may last for several weeks. The most common side effect is a "cortisone flare". This is a condition where the injected cortisone crystallizes and causes a brief period of severe pain, that usually only lasts for a day or two. This is treated by application of ice to the injected area. Other side effects include whitening of the skin at the injection site, infection, a transient elevation in their blood sugar in patients with diabetes. Arthroscopic capsular release and manipulation under anesthesia (MUA) are the surgical procedures performed to treat the frozen shoulder. Frozen shoulder, also called adhesive capsulitis is a condition characterized by pain and loss of motion in shoulder joint. This procedure is extremely useful in cases of frozen shoulder that do not respond to therapy and rehabilitation. The aim of the surgery is to decrease pain, reduce the recovery time and help to gain full range of movement. A manipulation under anesthesia (MUA) is most commonly indicated in patients with simple frozen shoulder. This procedure is performed with the patient sedated under anesthesia. Your surgeon moves the shoulder through a range of motion which causes the capsule and scar tissue to stretch or tear. Thus, the tight capsule is released allowing increased range of motion. 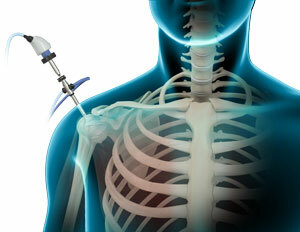 The procedure involves freeing the shoulder by manipulation and does not involve any incisions. Arthroscopic capsular release is a keyhole surgery that involves the release of the tight, constricted capsule. During the procedure 2 to 3 holes are made in the shoulder. The thickened, swollen abnormal capsule tissue is cut and removed using a special radiofrequency thermal probe. It is an effective treatment for most people with stiff shoulder after injury, trauma, or fracture, and diabetes. Following capsular release, immediate rehabilitation is necessary to prevent the recurrence of frozen shoulder. The aim of the rehabilitation is to reduce pain and to restore full range of motion. An appointment with the physiotherapist will be arranged in the first week following your surgery. The amount of exercises you require will depend on your progress. The shoulder joint is a ball and socket joint. A 'ball' at the top of the upper arm bone (the humerus) fits neatly into a 'socket', called the glenoid, which is part of the shoulder blade (scapula). The term SLAP (superior -labrum anterior-posterior) lesion refers to an injury of the superior labrum of the shoulder. The labrum is a ring of fibrous cartilage surrounding the glenoid for stabilization of the shoulder joint. The biceps tendon attaches inside the shoulder joint at the superior labrum of the shoulder joint. The biceps tendon is a long cord-like structure which attaches the biceps muscle to the shoulder and helps to stabilize the joint. Your doctor may recommend anti- inflammatory medications to control pain. In athletes who want to continue their sports, arthroscopic surgery of the shoulder may be recommended. Depending on the severity of the lesion, SLAP lesions may simply require debridement or some may need to be repaired. Â A SLAP repair can be done using arthroscopic techniques that require only two or three small incisions. The pectoralis major muscle or its tendon that gets attached to the arm bone (the humerus) can rupture. This is known as a "pec rupture," or a pectoralis major muscle rupture. It is quite rare and occurs only in men between the age of 20 and 50 years. Pectoralis muscle rupture may lead to partial or complete tear of the muscle. Partial ruptures are less common and complete rupture occurs when the tendinous attachment of the muscle to the bone tears. Percutaneous elastic intramedullary nailing of the clavicle is a newer and less invasive procedure with lesser complications. It is considered as a safe method for fixation of displaced clavicle fractures in adolescents and athletes as it allows rapid healing and faster return to sports. The procedure is performed under fluoroscopic guidance. It involves a small 1 cm skin incision near the sternoclavicular joint, and then a hole is drilled in the anterior cortex after whichan elastic nail is inserted into the medullary canal of the clavicle. Then the nail is passed on to reach the fracture site. A second operation to remove the nail will be performed after 2-3 months. Glenohumeral degenerative joint disease (GDJD), also known as osteoarthritis of the shoulder, is a condition characterized by degeneration or wearing away of the protective cartilage that covers the ends of your bones (articular cartilage). As a result of degeneration of the articular cartilage the ends of the two bones rub together and form bony growths (osteophytes). 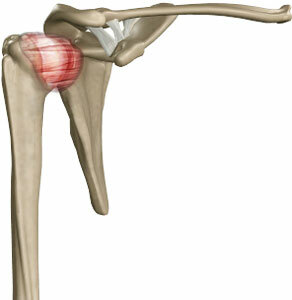 The shoulder is a 'ball-and-socket' joint. The shoulder joint is also called as glenohumeral joint, the joint formed by gelnoid and humerus bones. The shoulder joint is formed when a 'ball' at the top of the upper arm bone, humerus, fits neatly into a 'socket', the glenoid, which is part of the shoulder blade. Glenohumeral DJD is most often seen in people over 50 years. It can also develop after an injury or trauma to the shoulder. The condition may also be hereditary. A person with glenohumeral DJD is likely to have tenderness and shoulder pain that aggravates during activity. Swelling of the joint may also be seen. You may hear a clicking or creaking sound as you move your shoulder. To diagnose glenohumeral DJD, your doctor will take a medical history and performs a physical examination of your shoulder. X-rays of an arthritic shoulder may be useful to see osteophytes and loss of joint space. Treatment for glenohumeral DJD includes both nonsurgical treatment and surgical treatment. 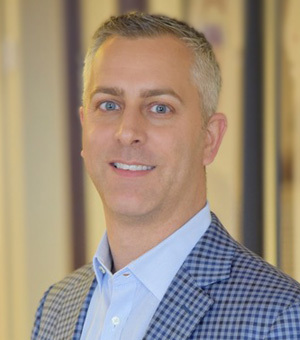 Non-surgical treatment includes use of anti-inflammatory medications, applying ice, moist heat to joint, performing range-of-motion exercises and physical therapy, corticosteroid injections, and dietary supplements of glucosamine and chondroitin. Surgery may be indicated if nonsurgical treatments are not effective. Glenohumeral DJD can be surgically treated with two forms of replacement, hemiarthroplasty and total shoulder arthroplasty. In total shoulder arthroplasty, the entire shoulder joint is replaced with an artificial joint where as in hemiarthroplasty only the head of the upper arm bone is replaced. Shoulder joint replacement is a surgical procedure performed to replace the damaged shoulder joint with the artificial joint parts. Shoulder joint replacement is usually performed when the joint is severely damaged by osteoarthritis, rheumatoid arthritis, post-traumatic arthritis, rotator cuff tear arthropathy, avascular necrosis, and failed former shoulder replacement surgery. During the surgery, an incision is made over the affected shoulder to expose the shoulder joint. The humerus is separated from the glenoid socket of the scapula. The arthritic part of the humeral head and the socket is removed and prepared so as to take the artificial components. The glenoid component is then pressed into the socket, and the humeral component is cemented into the upper arm bone. The humeral head component made of metal is then placed on the humeral stem. The artificial components are fixed in place. The joint capsule is stitched together. The muscle and tendons are then repaired and the skin is closed. Acromioclavicular (AC) joint arthrosis or osteoarthritis of the acromioclavicular joint is a condition that develops when the cartilage cushioning the AC joint in the shoulder begins to wear out. 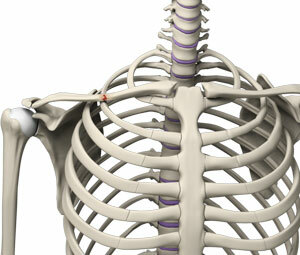 The shoulder is a 'ball-and-socket' joint. A 'ball' at the top of the upper arm bone, humerus, fits neatly into a 'socket', the glenoid, which is part of the shoulder blade, scapula. The shoulder joint is made up of three bones, the collarbone (clavicle), scapula (shoulder bone), and humerus (arm bone). 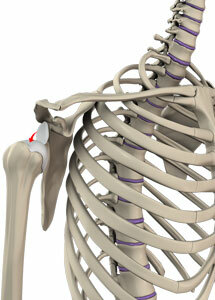 The AC joint is located where the clavicle meets the end of the shoulder blade, acromion. The AC joint osteoarthritis occurs as a result of repeated movements of the arm and overhead activities. People who lift heavy weights overhead such as weightlifters and those involved in overhead sports such as basketball are at increased risk for developing osteoarthritis of the AC joint. Another common cause is a previous injury to the AC joint causing AC joint separation. Osteoarthritis in the AC joint may cause pain and tenderness in front of the shoulder. Moving the affected arm across your chest may compress the AC joint and worsen the pain. Pain also radiates to the shoulder, front of the chest, and the neck. In patients who had previous shoulder injury, bumps appear around the AC joint. You can hear a snap or click when you move your affected shoulder. Diagnose of AC joint osteoarthritis will be made by collecting medical history and physical examination. During physical examination, your doctor will look for tenderness over the AC joint and pain with compression of the AC joint. To confirm the diagnosis a local anesthesia may be injected into the joint to temporarily reduce the pain. X-rays of the AC joint will be taken to reveal bone spurs around the joint and narrowing of the joint space. Treatment for AC joint osteoarthritis includes both nonsurgical treatment and surgical treatment. Non-surgical treatment includes rest, use of nonsteroidal anti-inflammatory medications, physical therapy, and injections of corticosteroids. Surgery may be indicated if nonsurgical treatments are not effective. Resection arthroplasty is the surgery of choice for AC joint osteoarthritis. During this surgery, your doctor removes about half-inch of the clavicle bone at the end where it meets the scapula. As the process of healing, scar tissue will fill the space created by removal of a piece of clavicle bone. The scar tissue allows normal movement of the AC joint and avoids rubbing of bone ends. The surgery may be performed using minimally invasive technique or using arthroscope. The acromioclavicular joint (AC joint) is one of the 3 joints in the shoulder and connects the clavicle (collar bone) to the scapula (shoulder blade). The AC joint is held with 4 main ligaments, the superior (above the joint) and inferior (below the joint) ligaments, the coracoclavicular ligaments, and the coracoacromial ligament. Coracoclavicular ligaments are the ligaments that connect the coracoids process (bony prominence on the scapula) and the clavicle. Coracoacromial ligament connects the acromion to the coracoid process. Injury to AC joint causes separation and the tear of ligaments. More severe cases require AC joint reconstruction surgery to stabilize the joint which involves replacement of torn ligaments and stabilizing the reconstruction. The original Weaver-Dunn procedure involves removal of a portion of clavicle bone at its lateral end, separation of coracoacromial ligament from acromion, preparation of coracoacromial ligament and reattachment of the ligament to clavicle bone. The modified Weaver-Dunn technique involves additional stabilization of the transferred ligament using screws or suture around the coracoids & clavicle. During the procedure, surgeon expose AC joint by an incision from top-front of the shoulder extending down over the coracoids process. The lateral end of the clavicle is cut in oblique angle and the coracoacromial ligament is detached along with a piece of bone from acromion. Surgeon drills holes in clavicle bone to fix the detached coracoacromial ligament and also drills the inner core of clavicle. Then the new ligament is pulled in to the cavity and is secured using the suture cords.Â Furthermore, a suture cord is passed around the base of coracoids and clavicle to stabilize the reconstruction. Following reconstruction and stabilization the surrounding muscles are repaired and incisions are closed. Postoperative rehabilitation includes use of shoulder sling for 6 weeks followed by physical therapy exercises. This helps restore movements and improve strength. All movements and activities above the shoulder level must be avoided for first 12 weeks following surgery. The most common complications of surgery include infection, nerve and blood vessel injuries, continued pain or stiffness, fracture, unsuccessful surgery, ligaments re-tear, and revision surgery.